How was Sami going ever to believe that his anger and fury would one day disappear? This is the story of how Sami, the evil monster from Big Forest, became a good monster. Everything began when Samy was on his way to town ready to carry out his plan of scaring all the children there. The town, called Vill, was situated on a high hill in the forest, on the other side of the river. “Where do you think you’re going? 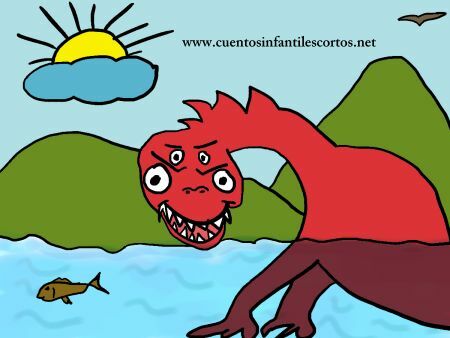 You can´t cross the river, it´s the deal we nade with the people of Vill!” Samy turned around to see a female monster looking at him with a smoking nose, an expression of anger. When Samy saw Vicky he began to feel strange feelings in his stomach, but tried to ignore them. “But… who are you? I don´t care about the deal, I´m crossing anyway! Ha ha ha” – said Samy. “Nobody will stop me from carrying out my plan!” – said Samy. He was about to kick Vicky when he looked into her big green eyes and his heart began to beat very fast, Samy stood there paralysed. “What are you doing? Come on brave Monster, are you scared?” – said Vicky. “Well… I’m thinking actually,” – said Samy with a trembling voice – “I’m thinking that maybe you are right, maybe we should not break the deal.” – he continued. Vicky looked into his eyes and his shyness touched her and she instantly changed her attitude. “I´m going back to the forest, do you want to come?”- she asked. And they walked back to the forest together leaving the river behind them. And that´s the story of how Samy changed his bad behavior and became a nice monster. And of course, they fell in love and got married and had lots of kids, which live with them in Big forest and help them to take care of all the townspeople around.